Stories of Hope | Providing help. Creating hope. Clearwater, FL (by Teresa Peterson on April 15, 2018) – Richard Peete had a family and a successful, middle-class life and he dreamed of a bright future. But things changed drastically in 1998 when his 28-year-old wife and four-year-old child died in a car accident. While still suffering from that trauma and pain, he lost his job because of the recession and housing market collapse. Later, health problems caused him to become homeless. “Everything I ever loved and worked hard for my whole life went away and I couldn’t stop it from happening,” said Peete. He is now a resident of Pinellas Hope and he is receiving counseling and medical care and is a candidate for long-term housing at Pinellas Hope. “Since I arrived at Pinellas Hope, I have been able to live my life in hope every day. Without hope, there would be nothing to live for,” said Peete. 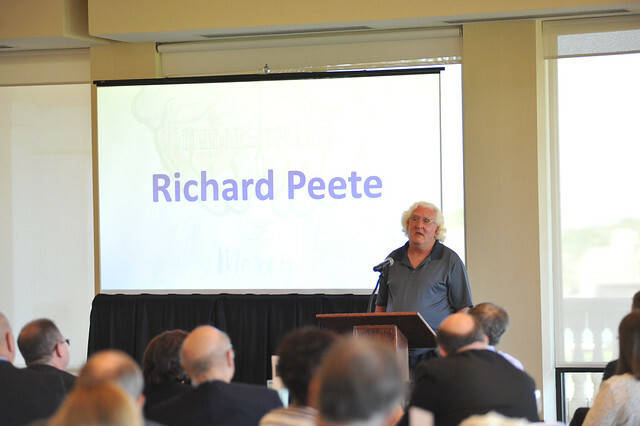 Peete is one of four clients of Catholic Charities who spoke about how their lives have changed because of the good work of this ministry of the Diocese of St. Petersburg. The others included: Jacky Cruz, daughter of a migrant farmworker family receiving affordable housing at San Jose Mission, who is entering law school; June Libby, a retiree who received disaster assistance after Hurricane Irma; and Janet Macke, another Pinellas Hope resident who is returning to self-sufficiency with help from one of the many service partners provided at Pinellas Hope – the Answered Prayers Project. Their stories of hope captivated close to 150 people who gathered at the FeatherSound Country Club on April 13 for the 4th annual Breakfast of Mercy. The first Breakfast of Mercy was held during the Year of Mercy proclaimed by Pope Francis. Three Angel Awards were presented to those who have demonstrated outstanding support of the charitable ministry. Allegany Franciscan Ministries was honored for their partnership, which has been 20 years in the making. They currently provide financial and operational support for the La Esperanza Free and Charitable Medical Clinic at Our Lady of Guadalupe Mission in Wimauma. “If it were not for Allegany we would not be saving the lives that we’re saving. Allegany is also helping us support the most innovative medical respite program in the country at Pinellas Hope,” said Mark Dufva, executive director of Catholic Charities of Diocese of St. Petersburg, referring to Catholic Charities partnership with St. Anthony’s Hospital, a BayCare Health affiliate. Fourteen-year-old Callee Connon was recognized for her bicycle donation program. She raises money to purchase new bicycles for people in need, including residents of Pinellas Hope. Her “Bikes for Buddies” organization has donated more than 500 new bikes since 2011. Patricia Safuto was recognized for her compassion and dedication as a volunteer at the Hernando Outreach Center in Spring Hill which offers a respite program for people suffering from Alzheimer’s, temporary housing assistance and assistance for women facing an unplanned pregnancy. Rob Marciano, program host from Spirit FM 90.5 emceed the event. Bishop Emeritus Robert Lynch delivered the keynote address focused on the pope’s new Apostolic Exhortation, “Rejoice and Be Glad.” Bishop Gregory Parkes delivered the Invocation and spoke to attendees, along with former St. Petersburg Mayor, Rick Baker. Monsignor Robert Morris, Vicar General of the Diocese of St. Petersburg, provided the closing prayer. Last year, Catholic Charities helped more than 15,000 people serving more than 200,000 meals in its three areas of assistance, known as the Ministries of Mercy: Foundations of Life, Friends in Need and Shelters of Hope.